Faculty, staff and students came together to mourn the loss of Ryann Schmidt, Columbia College’s area coordinator for Banks and Hughes halls. Schmidt passed away Oct. 25 from a blood clot in the knee that required surgery two weeks before. Schmidt was 25. Though he died at a young age, he left many memories behind. 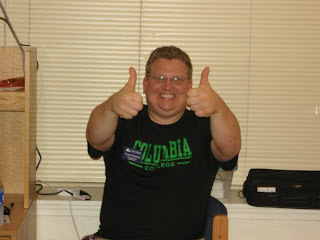 Schmidt began working for Columbia College as an area coordinator in June 2008. In his position at Banks and Hughes halls, Schmidt was the administrator of the buildings and the staff and students in the halls. Schmidt also served as supervisor for the information desk in the Atkins-Holman Student Commons, and he assisted the director of Student Activities with the Student Activities Commission. Soon after Schmidt’s death, a Facebook page was created for people to tell stories and remember the good times with him. The group now has 547 members. But the Facebook page was only the start in celebrating Schmidt’s life. At the request of students and staff, Campus Life and the resident advisors coordinated a memorial service at the college. They suggested people wear red in honor of Schmidt’s love for the St. Louis Cardinals baseball team. Dulany Banquet Room was set up like a dorm lounge with couches and chairs, and more than 80 students, faculty and staff attended and shared their stories. Faye Burchard, dean for Campus Life, began the service by saying she realized after hearing stories from students the day before that the Schmidt she knew was different than the Schmidt the students got to know. She described Schmidt as a team player and a go-to guy. Many students shared memories of Schmidt’s competitive trash talking and how he would jokingly tease them. Others told stories of how helpful and caring he was. President Gerald Brouder also spoke at the memorial and gave his condolences. Julie Freebersyer, Schmidt’s fiancée, said on the Facebook page that because of donations in his honor, she and Schmidt’s family were able to purchase the biggest brick available at Busch Stadium, home of the St. Louis Cardinals. Freebersyer said the brick will read, “For Love of the Game Ryann K. Schmidt-Sports Fanatic May 29, 1983-October 25, 2009.” Sue Schmidt, Ryann Schmidt’s mother, said via Facebook that in April 2010 a tree will be planted in Forestwood Park in Ferguson, Mo., where Schmidt played and umpired baseball games. Photo courtesy of Campus Life.